Last spring my family had the chance to travel to the mountains of West Virginia to visit my husband’s extended family. The highlight of the trip, for me, was visiting the farm where my mother-in-law grew up: deep in the Shenandoah Valley, nestled between the rolling hills and a hilly mile’s walk from the nearest road – which wasn’t paved. (And the nearest road wasn’t a big one, either.) The best part of that walk? Crossing the swinging bridge. I had heard about this bridge for years – 50 feet of aged wooden planks and rope hovering 15 feet above a chilly mountain stream. I was excited to see it and get to experience what has become a Bolyard family legend. I’ve crossed swinging bridges before, but what I always forget is how they…well, swing. And bounce. And sway and lean. And I never remember how the movement of everyone else on the bridge affects my passage across. If you’ve ever crossed a bridge like that, you know what I’m talking about. Walking across the bridge by yourself is one thing…but in a group? A different experience entirely. On that gray April morning, I took my place in the line. I was only a few feet onto the bridge as our leaders – my daughter and her cousins – reached the middle of the bridge. At that point, things got a little dicey for those of us behind them. I won’t lie: the bounding and swaying was a little unnerving, and I was relieved as the kids stepped onto solid ground and their exuberant steps left us behind. As each person stepped off the bridge, it bounced a little less. Things became smoother. Balancing wasn’t as complicated and the high-alert focus eased. I don’t know what I had expected from a bridge built that way, but I will say this: it was kind of an adventure. It was really fun. Days later, as I was looking back at my pictures from the trip and remembering that bridge passage, it really struck me how life in community is a lot like that bouncy, leaning bridge. Because any time more and more people step into our journey, things get a little more complicated, do they not? I’ve been learning this in new ways over the past year or two as I’ve allowed myself to re-enter community. I lived in isolation for years – experiencing the “alone in a crowded room” phenomenon every time I stepped into my church building. That wasn’t a particularly fun time in my life; loneliness and bitterness and resentment occupied far too much space in my heart. I will say, though, that even in the unhappiness of that season, things were relatively easy. It was just me, after all. I had my own issues and created my own drama, but it didn’t bump up against those of too many other people. (My husband always gets the brunt of the impact, and my mom and daughter are close behind.) Conflict was at a minimum, my calendar was wide open and free, and the concerns of my small circle of people didn’t occupy all of my head space. It was a pretty simple time. But now things are different. There are people. Real people, with struggles and quirks and conflicts and real lives. I walk with them through hard seasons, and I celebrate with them when the storms pass. If there is intense sadness, I feel it, too. IF there is a change in their schedule or routine, it can affect me, too. If there is heartache, my heart aches, too. I feel pain and experience sadness and rejoice in their happiness. On the flip side, those people? They know me – really know me, with all of my rough edges and awkward jokes and quirky habits. They see me – how I have one smile on good days, and a completely different smile for days that are hard. They hear me – both the words I say and those that go unspoken. Being known, I think, is one of the greatest needs we have…and is simultaneously one of the hardest things we have to do. First comes transparency – allowing others to see into our lives. Then comes the challenge of vulnerability – willingly allowing others to get close to us and enter into our lives. As people draw close, our lives bump together. That doesn’t necessarily mean conflict, but it does mean life isn’t quite as smooth as it might be otherwise. …but it’s a lot better. Because what I’m understanding more and more is that none of us were created to do life alone. It seems easier that way, yes, but the easy way isn’t always the best way. And the easy way isn’t always the most fun. The easy way of solitude lacks a lot of the laughter and adventure offered by the trickier path of community. I don’t know when my mother-in-law’s family built that swinging bridge leading to their farm in the valley. From the looks of it, it’s seen many people safely across over many years. I don’t know how old that bridge is or at what point they decided it needed to be built. I am almost certain, though, that had only one person needed to cross, there would be no bridge there today. Because for only one person, a bridge wouldn’t be necessary. 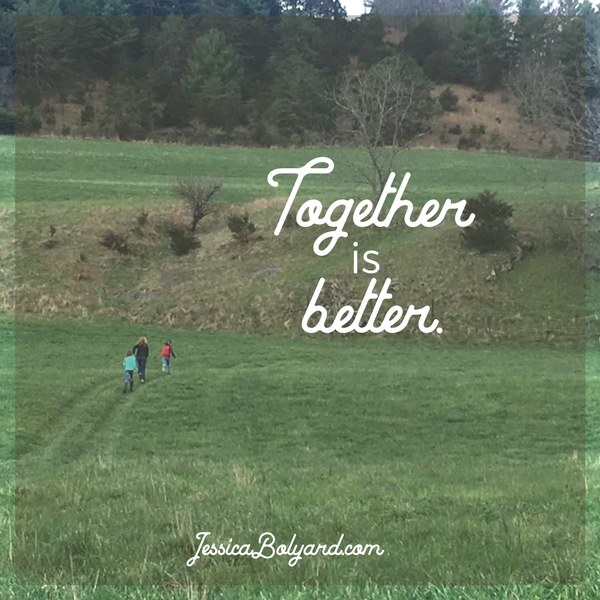 But because more than one person was on the journey – people were traveling together – they needed a way to cross together. And when they found that path? It was bumpy, yes, but a whole lot better than crossing that mountain stream on their own. We have bridges like that in our own communities, even if we live far from the rolling hills of the Shenandoah Valley. Our churches are the bridges that connect our lives. They make things a little more dicey – a little more complicated – but they’re there to get us safely across to the other side. So friend, my challenge for you today is this: find community within your church. If you don’t have a church you can call home, find one. Take a chance on people. Feel your story bump up against someone else’s. Let yourself experience the roughness, bumpiness, and uncertainty of relationships. The passage through life won’t be quite as smooth or easy, for sure, but it’ll be a lot more fun…and I suspect more of what it’s supposed to be like, anyway. After all, if there were just one person, the church wouldn’t be necessary. But there isn’t just one person on the journey, and we can’t forget that. 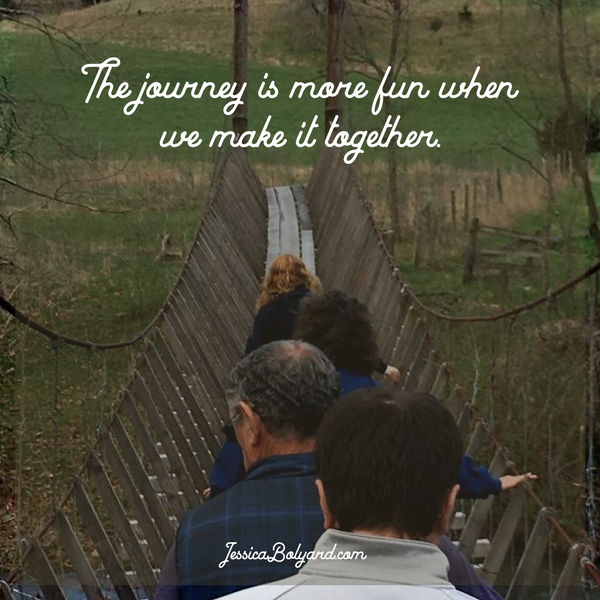 We’re all on this bumpy swinging bridge together.